I was awake by seven and lay there listening to the babblingg creek and the occasional truck as it thundered along the highway nearby. Okay get up you lazy sod I emerged mm tent was soaked by dew that’s the problem when you sleep by a creek .I gathered up all the spare food and rubbish and walked over to the campsite across the road and put it in the dumpster visited the bathroom and headed back.i stripped off the fly and draped it over a tree to dripdry.itwas then that I noticed that i had left out my food bag or other bits .luckily nothing had been touched (Eaten) .I slowly packed up ,twinkle toes was just emerging and had eggs boiling in her jet boil. The other hiker was cowboy camping but I didn’t get his name.he must of been very damp!! I crossed the main road from the trailhead put my head down it was 9am late for me but ive just been tired so I am not doing a big day today and stomped off up the trail. I didnt look at the GPS as I didn’t want to see the climb.but I knew there was one. It was a gorgeous morning if anything a little too warm for a fully re supplied hiker but thats the trail. The next part of the trail was like a tank training ground huge ruts and bogs to manoeuvre over and arround whilst going up hill such fun NOT!! !.Well maybe a little.i pressed on then it was time for my favourite game of climb the log some are easy some take some doing with a fully laden pack but as ive been doing this a while now I got full points hurrah. So I decided to stop early and eat breakfast. .I sat on a log and as I was getting my food out a huge branch crashed to the ground from a nearby tree making me jump!! I set off again and was now travelling through some beautiful meadows with meandering creeks running through them.i had to cross many of these. A thing I havnt done since calafornia . .up a head I came across a family out for a weekend hike .Dad was singing away with the kids joining in .I passed them and said enjoy your hike the usual greeting. Not an awfull.lot to see today but I’m sure Washington has a few more surprises as i entered another forest .but with the sun on it it had that lovely smell of pine one of my favourite smells out here. I could then hear the roar of water I wandered over to a clearing where I could see. Another fantastic waterfall / Rapids I stood snd watched it for a while before moving on.i was begining to go down hill which normally means its time for a climb soon lol. That will do. I dropped my pack then spread out my footprint to dry in the sun.then I did the same with the fly. 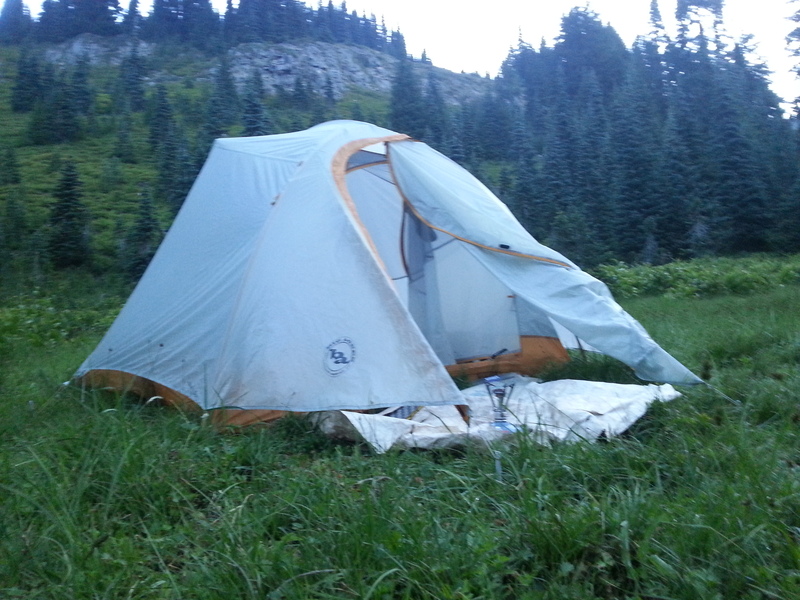 I then put up my tent, and when the footprint was dry slid it over the top then put the fly over. The sun was still hot so I aired my sleeping bag over my tent and lined up my socks to air too.they had just been washed but they needed some fresh air through them.